Everybody likes spending their holidays basking in the sun, with the sea breeze tousling their straw hats. Bubbling cold drinks, frozen sweet treats and a beautiful horizon create a lovely atmosphere and if you’re just a stone’s throw away from the main city centre, the experience becomes as convenient as it is refreshing. If you’re in this busy city of Cardiff and want such a delightful break, then you’re in luck as just a few miles away, is the beautiful seaside resort-town of Penarth. Also known as ‘The Garden by the Sea’, this highly popular holiday destination has been attracting holiday makers since the Victorian era. This reflects in the stunning Victorian and Edwardian era architecture that can be found all around, resulting in much of the town being designated conservation areas. The town was once an exceedingly important port from where coal was exported and today, the development by the Marina has transformed the area into a luxurious resort area with many family owned shops and outlets as well as big brands.It’s proximity to Cardiff’s Bay makes this an ideal way to wrap up after exploring the Bay’s features. 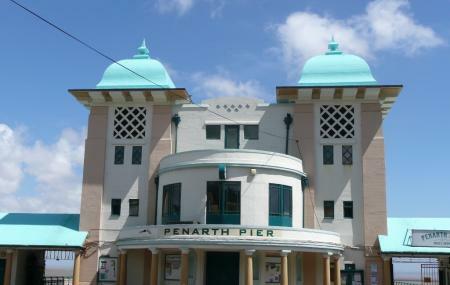 A fully restored Art Deco pier pavilion is home to a cinema, gallery, cafe and restaurant. Many exciting events, such as film festivals, take place here and are complimented with delicious food and drinks. Combine these with the stunning views of the sea and you get magnificent Penarth Pier Pavilion. The Pavilion itself is considered a non-profit and aims to engage the community through arts and the environment. There are numerous restaurants and cafes by the seaside, providing quite a nice variety of edibles and drinks. You can watch the sun set, or rise, while dining. Besides restaurants and clothing shops, there are many chemists, jewelers, stationers, hair dressers, travel agents, hardware stores, gift shops, art galleries and the Windsor Arcade. Other Hours: The different eateries, shops and hotels along the Bayhave their own timings. Tips and Warnings: As well as the more traditional form of public transport of buses and trains Penarth can be reached from Cardiff City Centre by waterbus and from Cardiff Bay by waterbus and a road train. By Bus: Contact Travel Line Wales 0871 200 22 33 for local routes. By Rail: Penarth station 1 mile. Tel: 08457 484950 for rail information. People normally club together Techniquest and Cardiff Bay while planning their visit to Penarth.